In order to explore the potential contributions that public administrators can make in resource management issues, this article will consider the case study of the Natomas levee project near Sacramento, California, one of the public projects that will receive funding through the WRRDA legislation. Addressing a crisis such as this depends on the complex interplay of local, state and federal issues, and the Natomas project provides a timely opportunity to see how public managers can make a difference even when it seems there are no easy answers. Any discussion of water resource management issues in California brings to light a number of critical issues, including the impact of persistent drought on agriculture, sourcing water for Los Angeles and other cities in southern California, and many others. However, an equally critical–if perhaps less widely recognized–issue in California is flooding. The Natomas basin is a flood plain north of Sacramento, California, bordered by the Sacramento River on the west and the American River on the south. To put it bluntly, the Natomas levees are crumbling. Following the flood of 1986, the Sacramento Area Flood Control Agency (SAFCA) was formed in 1989 through the joint action of city, county and municipal district action, charging SAFCA with developing a 100-year flood protection policy. 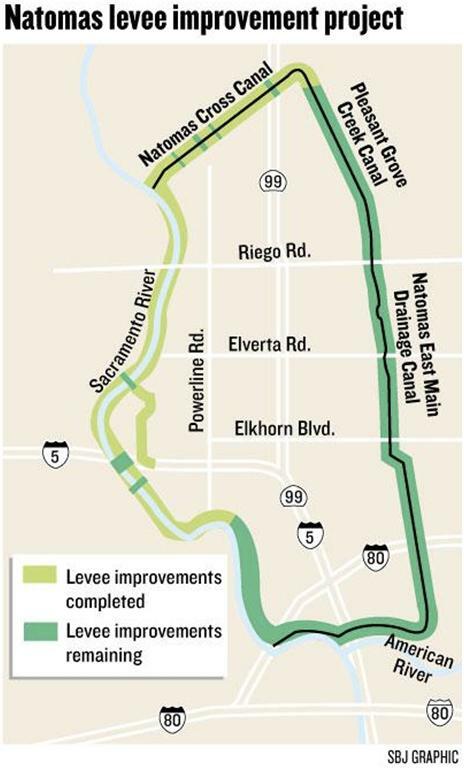 While property tax increases allowed SAFCA to repair 18 miles of Natomas levees, additional repairs have been on hold since 2008 when, according to the Sacramento Business Journal, “Federal Emergency Management Agency (FEMA) imposed a flood-insurance requirement that mandated all new construction to be elevated above the flood plain.” When this project was halted, the consequences for Natomas residents were immense. According to Melissa Corker writing for the Sacramento Press, existing homeowners faced falling property values and the necessity of buying flood insurance, while new construction was banned in the Natomas basin until 100-year flood protection was restored. With no new construction, falling real estate values and the very real threat of flooding, a host of urgent public management issues all crystallized around the need to complete the levee project. The immense complexity of California public resource management reveals the truth of Hundley’s words. In fact, while the WRRDA authorization of $1.1 billion for the Natomas project brings much-needed relief to the immediate crisis, Natomas still represents a high wire act for legislators and public managers. The counterweights of short-term crisis management and long-term resource sustainability show how precarious a balancing act this can be. U.N. Public Service Day is a good time to remember that increasingly, local issues must increasingly be understood and addressed within a global context. As Gross and Hambleton observe in Governing Cities in a Global Era: Urban Innovation, Competition and Democratic Reform, local governments increasingly face issues with global reach as “global forces map onto an uneven terrain of politics and power.” In fact, it could well be argued that these days all ecological issues are inherently global, and in truth, scenarios like those faced in the Sacramento area are replayed all across the country in a wide range of ecological contexts. From the changing landscape of coal mining in economically depressed regions of Appalachia, to the challenge of maintaining wetlands ecosystems on the East Coast, in every case public managers are on the front lines of very real ecological and economic challenges. In all these situations, entrenched public and private interests can hamper progress and confound even the most constructive initiatives. However, public managers can and must, make a difference. In many cases, public managers are in the unique position of being able to hear and respond effectively to the needs of all stakeholders. Often, this valuable perspective is unfortunately underutilized. In our increasingly connected world, public managers have the opportunity to take advantage of powerful new tools for increased communication and improved transparency made possible by the Web and social media. These tools can be put into action to provide greater clarity and public interaction in the communication of budgets and opportunities for public dialogue. This can make a significant difference in the public’s ability to understand and respond to legislation, and can serve to build public trust and mediate expectations when a lack of information flow might have otherwise have engendered public frustration. California’s water resource crisis should serve to remind us that whenever we face public management issues in our own local contexts, these issues do not exist in isolation from the national and global perspectives. Although there are often no easy answers, as public managers we must seek to ensure that, to the best of our ability, issues are addressed within the context of transparency and clear communication and with an appreciation for the global perspective. It is no understatement to say that our future depends on it. Author: Frank Woodward serves as assistant vice president for university advancement at Lincoln Memorial University. In May 2014, he completed the DPA degree at Valdosta State University. His research interest deals with performance-based funding policy in public higher education. He can be reached at [email protected], and followed on Twitter at @fwwoodward.